W ant to feel the true pulse of San Miguel de Allende? Head to El Jardín, San Miguel de Allende's vibrant heart. Following a tradition brought by the Spaniards nearly 500 years ago, every town in Mexico, large and small, has a central square. It's where friends meet, where gossip gets passed around, where you learn what's going on—and who did it. In most Mexican towns, it's referred to as the zocalo. But in San Miguel de Allende, that central square is called the Jardín Principal, the "Main Garden." But don't worry about translating it. Everyone, Mexican and foreign, just calls it the Jardín, and it is San Miguel's center, the main point of reference, the locale for fireworks and folkloric dancing, music and munching and just generally hanging out. San Miguel's Jardín always make me think of America in the '40s and '50s, before everyone was locked up inside watching television, before universal air conditioning kept people indoors, before fear made us hide behind locked doors. Every little town—and many large ones—had a Town Square. They were the social centers of town, where you went to meet and greet, gossip, cool off, get out. In the U.S., people used to use the Town Square. In Mexico, they still do. It's a large part of the country's charm. With the beautiful spires of the Parroquia towering on the south side, the gracefully arched portales east and west, the balloon sellers and ice cream vendors and Bernabé hawking newspapers from the wall in a rich, basso voice, the Jardín in San Miguel is probably where you'll take the most San Miguel photos. And it's the San Miguel de Allende you will remember most fondly when you return home. On a sunny winter's morning, there are so many ex-pats sitting on the south side benches in the Jardín, their faces turned to the sun like a row of basking lizards, that it's sometimes called "Gringo Gulch." But the Jardín in San Miguel is not just for foreigners. Latino cultures have a long tradition of using their public spaces to reinforce the idea of community, and Mexicans use the Jardín in San Miguel as a sort of communal backyard. That's especially true in the early evenings and on weekend afternoons. This is when you can really feel the Mexican heart of San Miguel—and you'll find relatively few gringos participating at that time of day. Here's what I saw on a typical Sunday afternoon recently while strolling through the Jardín: Teenagers flirting, little boys playing a lively game of pogs on the stone-paved walk. Abuelitas (grandmothers), gossiping on the wrought-iron benches under the manicured laurel trees. Tourists snapping pix of the Parróquia church. Vendors selling balloons, pull toys and pinwheels, candy, popcorn, and fresh-roasted corn-on-the-cob slathered with mayonnaise, white cheese, and chile powder. Tourists lining up in front of the ice cream wagon or snapping pictures of their kids atop the huge draft horse that pulls it. Babies in arms and in strollers. Mexican "ladies who lunch," not a hair put of place, discussing problems with their household help. Flowerbeds, where plantings change with the season, adding another layer of color and smell. Shoeshine men doing a brisk business with rag and brush. Mariachi music floats on the air, while the town band is playing in the kiosk, with lots of tuba "oom-pahing" and only a little off-key. Little boys are selling small packets of chicle, chewing gum, while Otomi women offer hand-stitched and embroidered dolls with yarn braids. The sidewalk cafes under the portales are doing a brisk business in cafe con leche, guacamole, flan, and delicious-looking full meals. There's a table with ladies selling tickets to an upcoming charitable fund-raiser. A crew is setting up some bleachers for a concert that will fill the air with sound later in the evening. 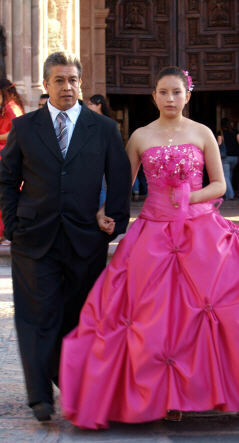 A quinceañera celebrating her 15th birthday walks from the church on her father's arm to pose for her first grown-up-lady photo in her beautiful formal gown. And every so often, the great bells of the Parróquia peal out the hour, the half hour, the quarter hour and send birds fluttering up from the trees. The Jardín is also the town's main point of reference when giving directions anywhere in San Miguel's centro—and even out of it. People will say "it's just two blocks north of the Jardín" or advertise an apartment as "five minutes walk from the Jardín." Making a date with someone? "Meet me in the Jardín" is probably what you'll say. If you want to find someone but don't have a phone number, just sit on a Jardín bench. Chances are, they'll walk by within minutes. There's even a more practical side to this core square. 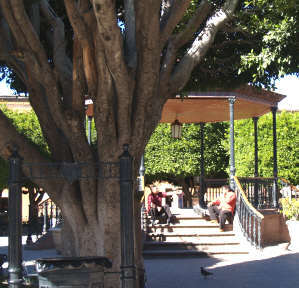 On the north side of the Jardín, San Miguel now offers one of its many public Wi-Fi "hotspots." You can sit there with a laptop and check your email, look up the phone number of your favorite San Mgiuel restaurant, or even don a pair of headphones, log into your Skype account, and call back home to tell them everything you're seeing, hearing, smelling in El Jardín, San Miguel de Allende's heart and soul.